* The following products were provided to me in exchange for my honest review. I have a new to me, and I think a fairly new indie brand to share with you today. The brand is called Savvy Naturalista. These polishes are made by Shundara who also has an awesome blog that features some yummy recipes and shop that also sells bath and body products. 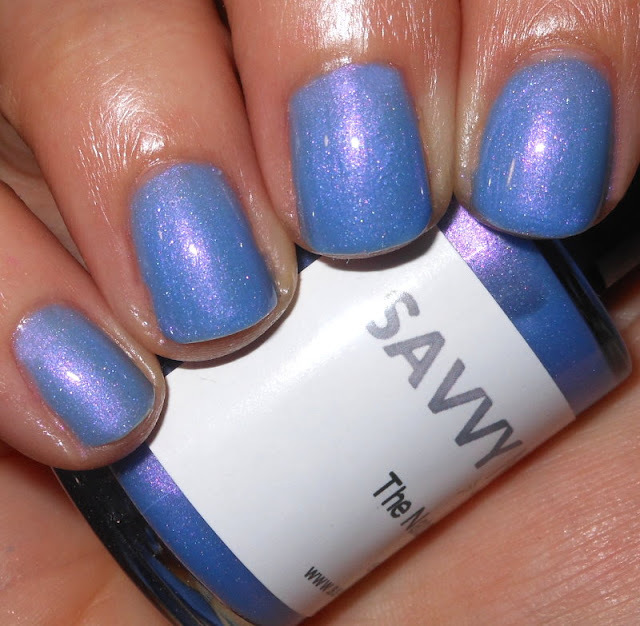 Savvy Naturalista nail polishes are vegan, cruelty, and 5 free. Let's get on to swatches! Let the Green Thumbs Roll is a lovely green crelly polish with bright pink, blue hex glitters, and green and gold mini glitter. 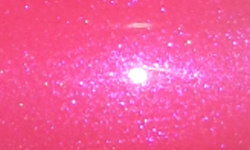 Bubble Gum Mystery is a pink jelly with violet-blue color shifting sparkle. 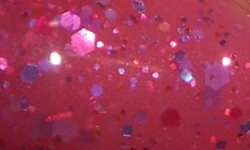 Pimp My Fuchsia is a medium mauve pink jelly with dark pink, purple, and blue holo glitters. 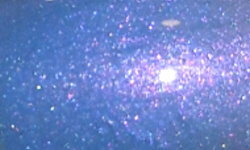 Blues Shifting Paw is a soft blue jelly with a pink-purple color shifting sparkle. Colors: These are beautiful colors. I love the variety of colors I received in these polishes. Let the Green Thumbs Roll and Pimp My Fuchsia are both very fun and beautiful coordinated glitter mixes. I love the types of glitters chosen to go with the ases. Bubble Gum Mystery and Blues Shifting Paw are soft colors jellies paired with beautiful eye popping shimmers. Formula: The formulas on all of these were very easy to use and apply. I used 3 coats for every swatch above. I did not have trouble getting the glitter in the glitter polishes to stick to my nail. I did find these colors to be sheer on application, and all would need at least 3-4 coats to reach opacity. This would dependent one if you use thick or thin coats and what level of pigmentation you like. 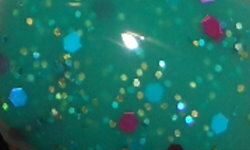 Price: The jelly glitters are $7.00 and the jelly with color shifting sparkle are $8. These can be purchased on Savvy Naturalista's website. Overall: I'm really like these polishes by Savvy Naturalista. I found the colors fun and innovative. I thought they all applied like a breeze. They are a bit on the sheerer side and do require more coats of polish, but the finished look of all these is beautiful. Oh I'm loving these, great swatches! Very pretty colors these are.